as 12-inch LP TRASAM 13.
and Chicken on a Raft (TRA EP 164). This sampler is not available on CD as far as we know and a copy of the album could set you a cosy £50 from a record collectibles shop or online. 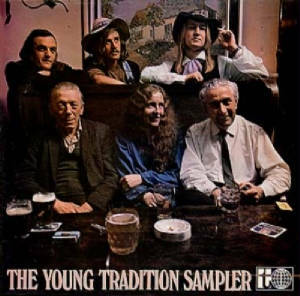 Fortunately all of Young Tradition's work is now available on other CDs, this sampler, though, is worth seeking out for the cover photograph featuring Young Tradition and three members of the legendary Copper Family.